A best-seller, the H270-2 high capacity post box is a stylish mail delivery solution for mixed-use properties such as office blocks and student lets. 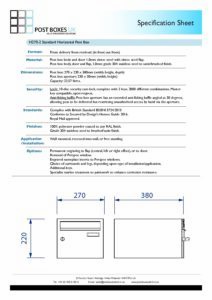 Designed to comply with the police initiative Secured by Design Homes Guide 2016, it is EN13724 compliant and designed to accommodate most envelope sizes, all the way up to C4 for A4 sized documents. It has a high capacity of 22.5 litres and compact dimensions of 270 x 220 x 380mm (width, height, depth). If you are looking to install a mail bank in a multiple occupancy residential building, the H270-2 large volume post box could be the ideal choice. Its semi-modular design allows it to be incorporated into a mail box bank with ease. Post Boxes UK offers an integrated service for buildings of every size, which includes everything from the initial design plans and drawings all the way through to installation. Highly versatile, the H270-2 Secured by Design post box can be wall recessed, wall mounted or left as a free-standing unit to complement every building. To complement interior and exterior landscapes, the H270-2 letter box is offered in a veritable rainbow of colours and finishes. Standard, non-standard, and multi RAL colours are available, along with premium finishes such as metallics, satin, matt velvet, and high gloss. Fire resistant paint and fire extinguisher paints are also available for buildings that must conform to the Building Control and Fire Regulations. Order your bespoke mailbox bank at Post Boxes UK today, and it could be installed within just 4 weeks. Our lead-times are dependent upon the size and design of your project, but we will always strive to meet your deadlines. Contact us to discuss your requirements. The H270-2 communal mailbox is made from heavy-duty steel (electro galvanised & stainless), and as such, it is weather resistant and suitable for both indoor and outdoor applications. For a sleek finish, finishing surrounds are recommended for H270-2 wall recessed letterbox banks. Post Boxes UK offers a range of high-end finishing surrounds to complement every installation such as 20mm and 40mm surrounds to create a ‘picture frame’ profile. For freestanding letter boxes, 1.5mm sheet surrounds (cladding) and 15mm volume surrounds are available for improved weather resistance on outdoor applications. For mailbox bank installation in high density accommodations where wall-mounting and wall-recessing may not be an option, Post Boxes UK offers a choice of post box support legs for freestanding H270-2 communal mailboxes. Side supports, pedestal legs, and combinations of the two are available. Note: for EN13724 compliance, the maximum recommended height for mailboxes is 1800mm from floor level. The H270-2 horizontal mailbox can be supplied with or without personalisation. For student lets, engraved nameplate inserts are a popular option, laser etching is ideal for multiple occupancy apartment blocks, and for office buildings, company named nameplates work exceptionally well. Contact us to discuss your requirements. A multiple occupancy mailbox requires a robust locking mechanism, and so the H270-2 letter box comes with a non-mastered Eurolock Cam Lock as standard. For mailboxes left in high-risk areas, Post Boxes UK offers a selection of premium locking systems to suit every environment. Contact us for further information on our mastered cam locks, combination locks, digital locks, and other security systems. At Post Boxes UK, we understand that one set of keys is never enough for a bank of communal letterboxes. That is why we offer replacement keys for all H270-2 apartment mailbox models, along with replacement lock systems. Discounts available for bulk orders. 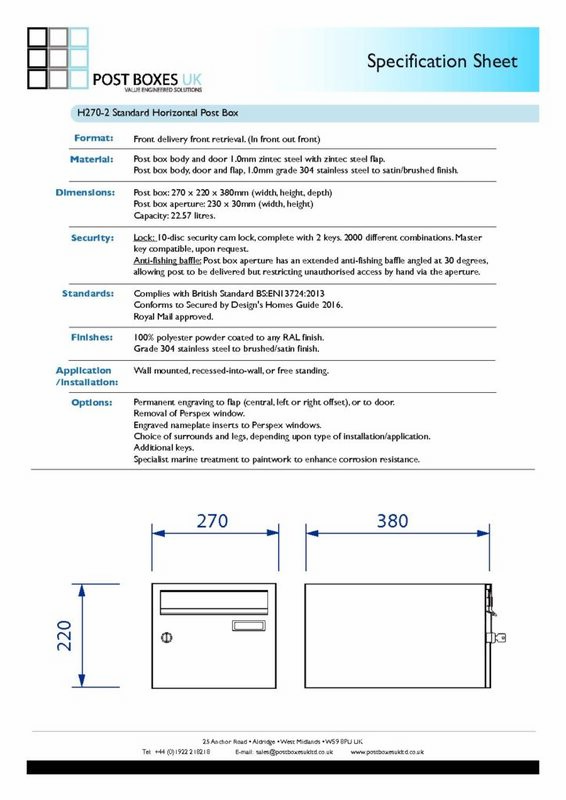 Fully compliant with the Secured by Design New Homes Guide 2016 and EN13724, the H270-2 communal mailbox is a smart investment for buildings big and small. It has an anti-fishing device to prevent tampering and a secure locking mechanism to reduce the risk of post-theft. The H270-2 is a double capacity mailbox designed to withhold a substantial amount of mail. Ideal for shared reception areas, student lets, and communal office spaces, it is a sizeable post box with a robust locking mechanism and a range of premium finishes.